desert diva : I love yellow! Beautiful. Love the cheerful yellow. OK, I'm not playing. Holy moly, this is absolutely STUNNING and there's no way ANYONE is coming up with anything better. Love the shading in the letters and around the flower - it adds so much dimension! GORGEOUS! I love the white highlighted by the yellow. What a great technique! Thanks for playing with Just Us Girls! I love your new blog header! It is fabulous! Your card is gorgeous. The touch of coloring around the embossing is beautiful! 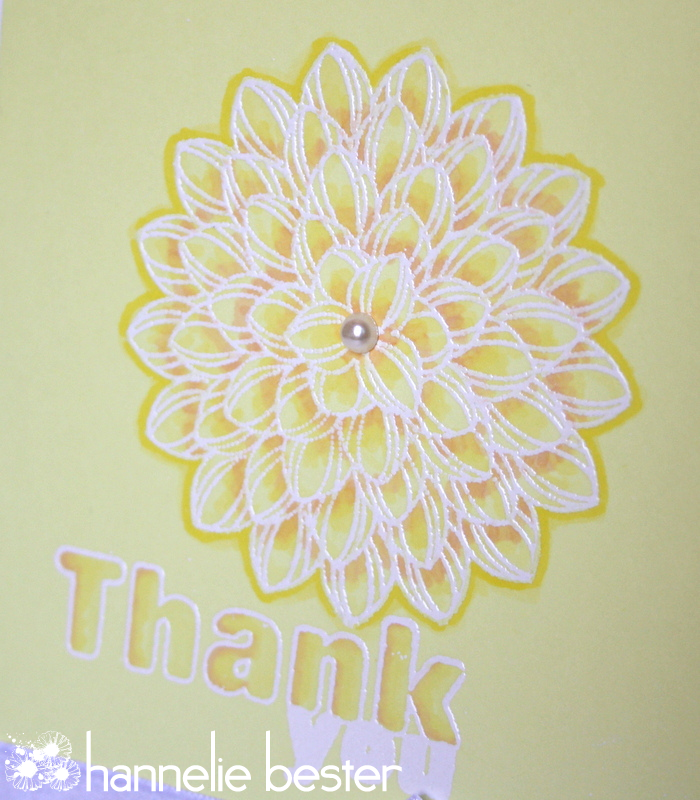 gorgeous colours for a gorgeous card! The colouring/shading is gorgeous...beautiful card! Wow! This card is just stunning!! I'm not really a "yellow" person but this works so well with the added touch of colour being the ribbon. Great job! I can only say "WoW!! I'm sorry I'm a bit slow getting around to commenting this week but I've been on grandchildren duty since last Thursday! ....oh my....rendered speechless (almost) once again! This is stunning, gorgeous, amazing, creative, beautiful, fun, perfectly executed, brilliant, dynamic...I could do the whole alphabet and still have more to say! Forgot to say...WOW - love your new look! So inviting,fresh and pretty! This is so pretty, Hannelie! It reminds me of a lovely yellow summer dress, matching belt, and stunning white corsage!! Thank you, as always, for your free stuff! I also wanted to say that I think your new blog look is divine!! So perfectly "you!" I forgot to say I envision the satin ribbon in her hair, even though that prolly goes without saying! Such a pretty card! :) Thanks for playing with us at CAS on Sunday! WOW! The dimension you've achieved in this one layer design is amazing...with beautiful effect! I love your shading! Thanks for linking up to CASOS! Pragtig fyn en vroulik. 'n Meesterstuk voorwaar. This is stunning! Love the white flower on the yellow. Beautiful coloring/shading.